JimHjelm Bridal gowns are designed by top bridal designer Francesca Pitera. The couture bridal gowns are timeless in their elegance. A graduate of the esteemed Otis Art Institute/Parsons School of Design in Los Angeles, Francesca parlayed her passion for creating eveningwear into designing the most memorable and important gown a women will ever wear— her bridal dress. Using unique details such as combinations of textures, colors and lace, Francesca creates wedding gowns that are classic and feminine with a touch of sensuality to make every bride the epitome of style and grace. 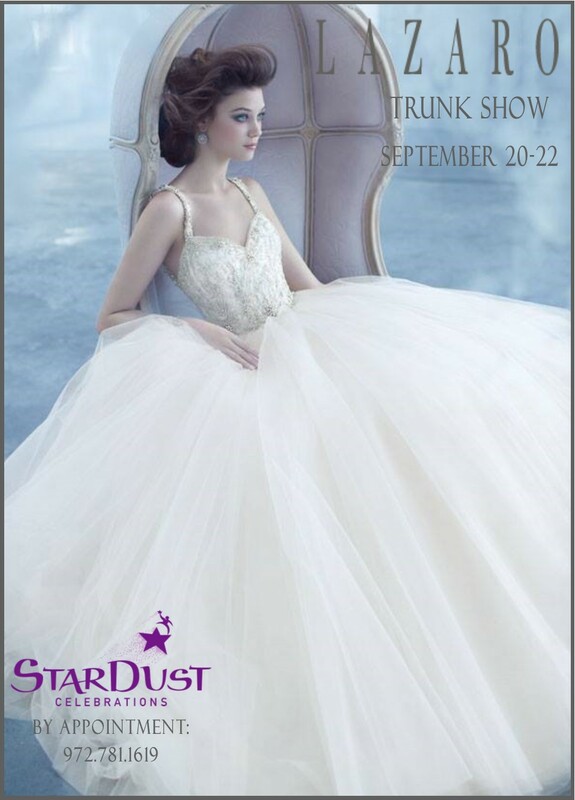 Enjoy an expanded offering of stunning Jim Hjelm gowns during our trunk show this weekend at Stardust. Call now for your appointment: 972.781.1619. 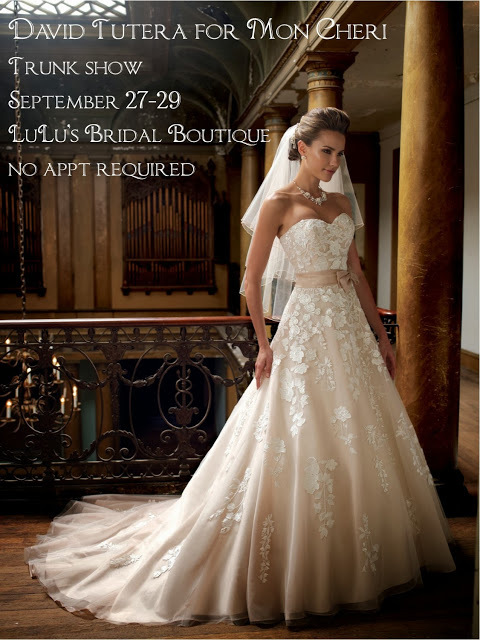 Join us at LuLu’s for a trunk show featuring Maggie Sottero this weekend! No appointment is necessary. We have two more fabulous collections being featured during trunk shows this weekend. 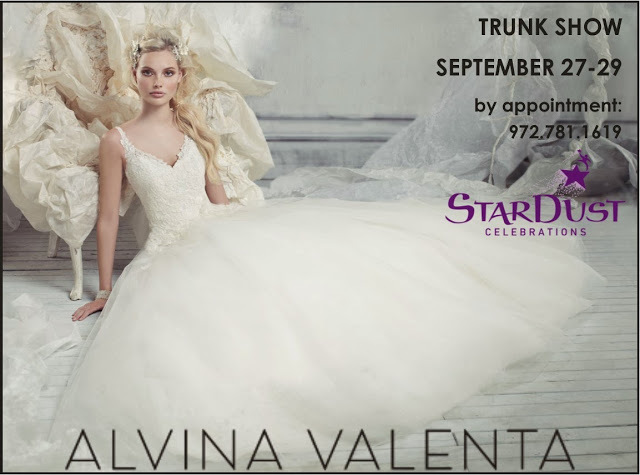 Always a favorite among brides, Alvina Valenta bridal gowns are known for their timeless elegance, sophistication and most especially their attention to detail. All of the dresses are finished by hand, including the beading and their signature hand rolled roses. Every hem is finished with lace right down to the petticoats. Alvina Valenta bridal gowns are made of the finest silks, satin shantung, and satin organza to name a few. You are cordially invited to the Alvina Valenta Trunk Show at the Bridal Salon at Stardust this weekend, September 27-29. Call 972.781.1619 for your appointment. 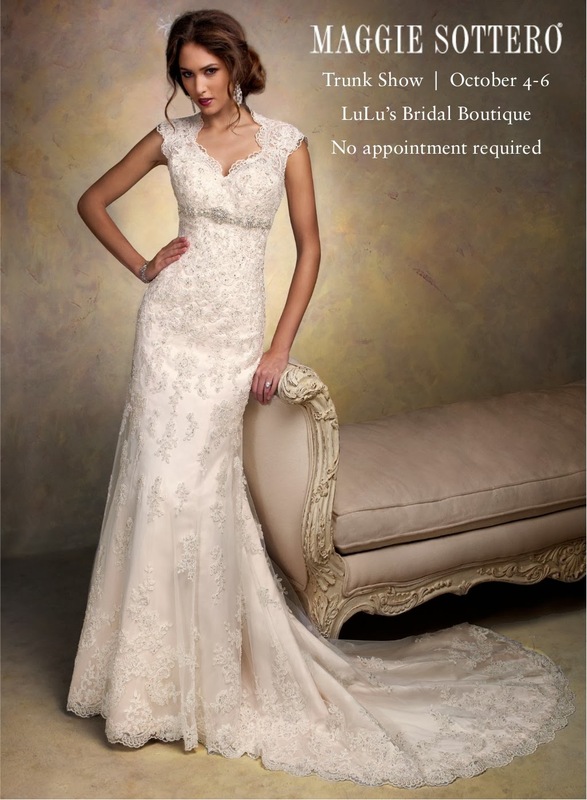 Join us at LuLu’s Bridal Boutique during our trunk show featuring these striking gowns. No appointment is required. 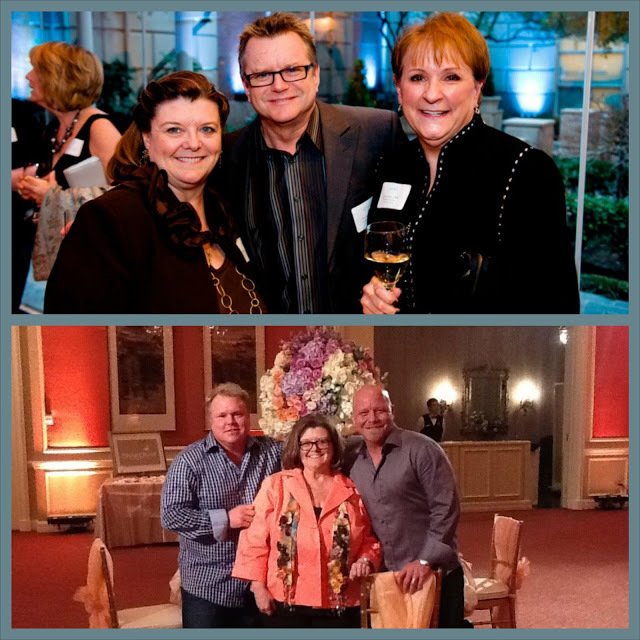 Q: As my full-service planner, how do you go about determining which vendors you will recommend I meet with? Do you get kickbacks from the vendors you recommend? 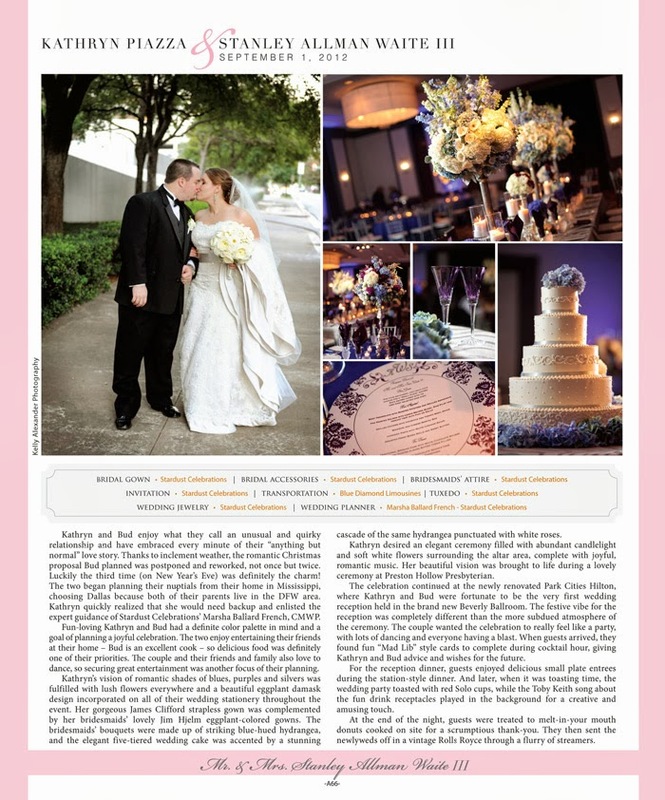 A: Our certified wedding planners have been doing this a long time. We are very involved in the DFW wedding industry and spend a great deal of time networking and getting to know the best vendors. We keep a database of vendors with lots of notes on our experience with them and each professional’s style, pricing/payment structure and personality, as well as details on their staffing, equipment and substitution policies. After talking with you about your wedding day vision and your budget, we start getting a sense of which vendors might be the best fit for you. We do not take kickbacks from vendors. Ever. We believe this is an unscrupulous practice and strongly recommend you stay away from any vendors that participate in this business model. Our recommendations stand on our research of and experience with the vendors. We want you to contract with the trustworthy vendors that best suit your vision because in all honesty, it will make our job as planner/manager/director (etc!) easier if we have the right team in place for your event! If you are interested in having our fun and creative wedding planners help you find the perfect vendors for your wedding day, contact us today for an initial consultation! A master of the craft of extraordinary bridal design, Lazaro gowns are timeless in their elegance, and the designer is known for his impeccable fit, glamorous collections featuring exquisite beading and embroidery with dramatic silhouettes. Priding himself on the ability to design for any bride, Lazaro features everything from slender silhouettes to ball gowns and styles that range from simple to extravagant. 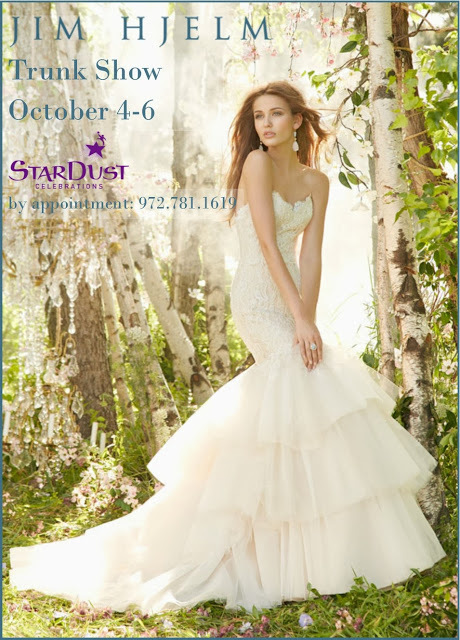 Join us at Stardust Bridal Salon this Friday, Saturday and Sunday to shop Lazaro’s gorgeous Fall 2013 collection. Call now for your appointment: 972.781.1619. Hailing from the world-renowned Spanish design house, Pronovias gowns are glamorous, sophisticated, bold and majestic. Pronovias gowns are decidedly feminine, designed to celebrate the female shape. Whether simply elegant, lavishly embellished or lace covered, Pronovias gowns are constructed with the utmost quality and are always fashion forward. 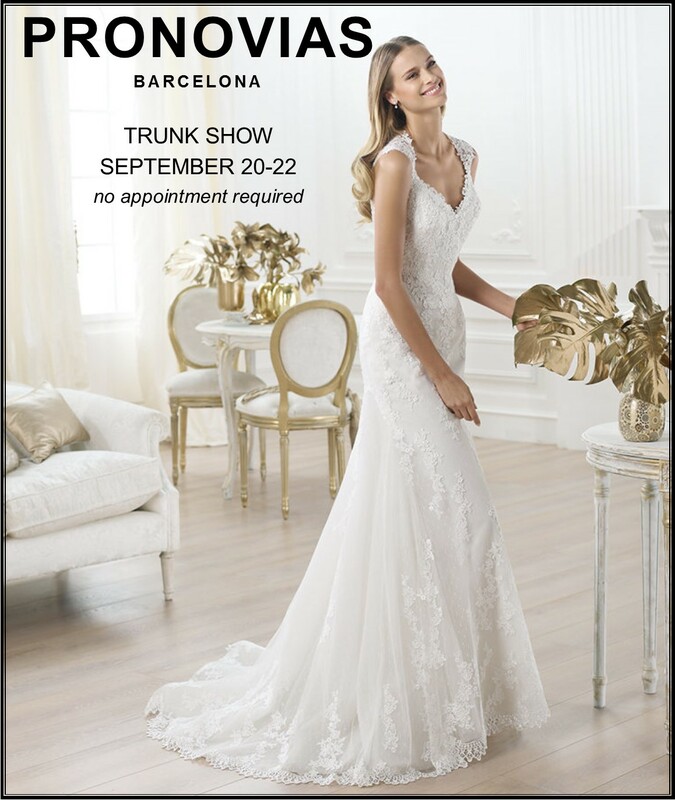 Come to LuLu’s Bridal Boutique this weekend to enjoy an expanded offering of the Pronovias fall 2013 collection during our trunk show. No appointment is necessary.